An ex-Microsoft worker faces criminal prosecution in the US over allegations he leaked work-in-progress Windows 8 software to a French blogger. Russian national Alex Kibkalo was arrested in Seattle, Washington, on Wednesday, charged with the theft of trade secrets, and held in custody without bail. 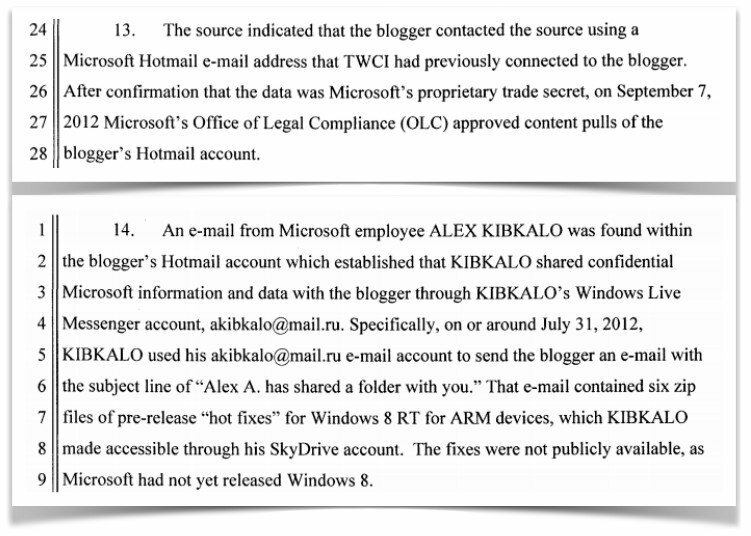 Kibkalo, who worked for Microsoft in Lebanon and Russia, allegedly gave his employer's confidential files to an unnamed blogger, according to a criminal complaint [PDF] filed by prosecutors. The French blog writer had a particular interest in posting screenshots of pre-release versions of the Windows operating system. In the complaint, an FBI special agent revealed details of an internal probe by Microsoft's anti-leak team, dubbed the Trustworthy Computing Investigations department, following a tipoff from a source: it's claimed the firm looked through its servers and uncovered evidence that Kibkalo had emailed the blogger's Microsoft-hosted Hotmail account to leak "proprietary and confidential trade secrets." The confidential data was allegedly shared via Kibkalo's personal Windows Live SkyDrive account between July and August 2012 while he was still an employee. The cache was said to have included pre-release software updates for Windows 8-powered devices, a copy of the Microsoft Activation Server Software Development Kit, and unreleased versions of Windows Live Messenger. Access to the development kit would be a boon for hackers trying to reverse-engineer the code used to thwart software piracy, the court in Washington was told. The alleged theft of the activation server software is the subject of the trade-secret theft charge against Kibkalo. The defendant, who was based in Lebanon at the time of the alleged leak, apparently used a virtual machine on a Microsoft-hosted server to facilitate the transfer of the purloined files. This data was offered to the blogger in emails sent from a mail.ru account to the writer's Hotmail inbox, the court was told. The pair nattered about the illicit exchange using Microsoft's MSN chat system, it was claimed. The alleged use of Microsoft's communications and storage technology for such an exercise was a dumb move as it made it easier for Redmond's sleuths to piece together their case: the software giant, on its own initiative, leafed through the blogger's Hotmail account and instant-messenger chatter logs in a bid to out the leaker, according to special agent Armando Ramirez's report to the court. The company's investigators reckon Kibkalo turned against Microsoft after scoring a poor performance review after working for the firm for seven years. The Redmond sleuths confronted him in September 2012, and then went to the FBI with their evidence the following July. The software architect, who is no longer a Microsoftie and was working for a US-based company at the time of his arrest, is also suspected of leaking Windows 7 files to a blogger he initially met on an online forum, the Seattle Post-Intelligencer reports. The blogger implicated in the case reportedly admits publishing the information he received as well as selling Windows Server activation keys on eBay. "We take protection of our intellectual property very seriously, including cooperating with law-enforcement agencies who are investigating potential criminal actions by our employees or others," a Microsoft spokesman said in a statement to reporters. Would-be whistleblowers, or anyone sensitive about their privacy, take note: the terms of service for Hotmail and other Windows Live things includes the line: "You consent and agree that Microsoft may access, disclose, or preserve information associated with your use of the services ... [to] protect the rights or property of Microsoft or our customers."